Picture this: you’ve been coming to the DAHLC and using the elliptical for a good 3 months now. Once a week (or maybe less depending on how busy you are) you move through the machines on the floor to get your strength training done. You are watching what you eat and trying to be more active during your day. However, you just can’t see any changes in your body! Does this scenario sound familiar? Why not try adding some regular, consistent strength training into your routine? What I am talking about is functional movement training with progression and CHANGE every few months. I want to see you vary your routine. Maybe you like to do certain exercises. Well, switch it up. Try an incline press instead of a flat bench press. Try some circuit training instead of moving slowly between exercises. But mostly, make sure the exercises you are doing are challenging! If you can do 12 repetitions, but you did 8 because Desiree told you to do 8….then by all means do 12! Then increase the weight on the next set. As always, allow your muscles 48 hours of recovery before strength training that same body area again. 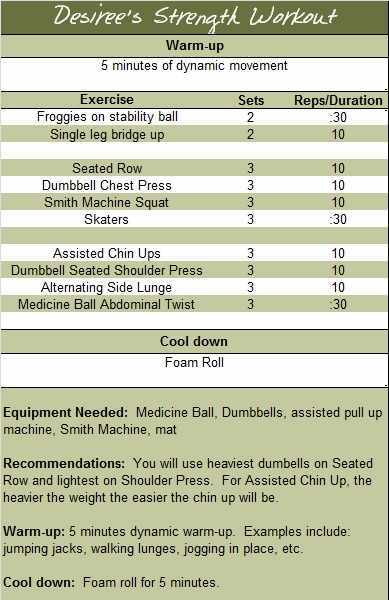 Try the following full body strength workout. 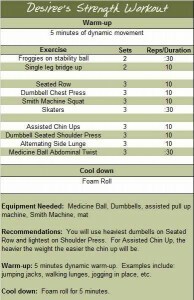 It will provide you a workout with all the movement patterns for a full body workout, including a warm up, nervous system development, strength training, and a cool down. To connect with me for additional workout resources, consider signing up for Small Group Training beginning in January. And to learn more about foam rolling, consider signing up for a Foam Roller Workshop.